What are the Advantages of Shockwave Therapy? Shockwaves accelerate the healing process by activating the body’s self-healing powers, particularly in cases where the body has been unable to do it on its own. It stimulates metabolism and enhances blood circulation which enables damaged tissue to regenerate and eventually heal. During Shockwave Therapy, a high-intensity sound wave interacts with the tissues of the body. This leads to a cascade of beneficial effects such as neovascularisation ingrowth, reversal of chronic inflammation, stimulation of collagen and dissolution of calcium build-up. Stimulation of these biological mechanisms creates an optimal healing environment. As the injured area is returned to normal, functionality is restored and pain is relieved. 1. Cell Level Change – shockwave stimulus affects the chemical environment of tissues at a cellular level. This causes changes to free radicals which boost the release of the substances that help to prevent pain and inflammation. 2. Blood Flow Change – Normal blood flow is critical to the healing process, and shockwaves create a revascularization effect. This type of stimulus redirects new blood flow into the affected area which improves soft tissue healing and regeneration. 3. Muscle Tone Reduction – Shockwave treatment reduces the contractile activity of muscle and can also break patterns of neuro-cognitive pain that are associated with chronic conditions. This effectively decreases muscle tone and spasm, and has specific benefits with eliminating trigger points. 4. Pain Reduction – Shockwave pulses directly affect the nerve fibres that transmit pain signals to our brain. Through the Gate Control Mechanism, shockwaves impact the interneurons in the A-β fibers which prevent the communication of pain. Ask your doctor or therapist if your condition can be treated by Shockwave Therapy and book your treatment sessions today! Shockwave Therapy is available at our Cook Street clinic located at 308-1175 Cook Street as well as our Main Clinic located at 100B-3200 Shelbourne Street. Call 250-381-9828 or 250-598-9828 to book an appointment. BACKGROUND: Chronic proximal hamstring tendinopathy is an overuse syndrome that is usually managed by nonoperative methods. Shockwave therapy has proved to be effective in many tendinopathies. HYPOTHESIS: Shockwave therapy may be more effective than other nonoperative treatments for chronic proximal hamstring tendinopathy. METHODS: Forty professional athletes with chronic proximal hamstring tendinopathy were enrolled between February 1, 2004, and September 30, 2006. Patients were randomly assigned to receive either shockwave therapy, consisting of 2500 impulses per session at a 0.18 mJ/mm² energy flux density without anesthesia, for 4 weeks (SWT group, n = 20), or traditional conservative treatment consisting of nonsteroidal anti-inflammatory drugs, physiotherapy, and an exercise program for hamstring muscles (TCT group, n = 20). Patients were evaluated before treatment, and 1 week and 3, 6, and 12 months after the end of treatment. The visual analog scale (VAS) score for pain and Nirschl phase rating scale (NPRS) were used as primary outcome measures. RESULTS: The patients were observed for a mean of 10.7 months (range, 1-12 months). Six patients were lost to follow-up because they underwent a surgical intervention: 3 (all in TCT group) were lost at 3 months; 2 (1 in each group), at 6 months; and 1 (in the TCT group), at 12 months. Primary follow-up was at 3 months after the beginning of treatment. The VAS scores in the SWT and TCT groups were 7 points before treatment (P = .84), and 2 points and 5 points, respectively, 3 months after treatment (P < .001). The NPRS scores in the SWT and TCT groups were 5 points in either group before treatment (P = .48), and 2 points and 6 points, respectively, 3 months after treatment (P < .001). At 3 months after treatment, 17 of the 20 patients (85%) in the SWT group and 2 of the 20 patients (10%) in the TCT group achieved a reduction of at least 50% in pain (P < .001). There were no serious complications in the SWT group. CONCLUSION: Shockwave therapy is a safe and effective treatment for patients with chronic proximal hamstring tendinopathy. Orthopedic Surgery, Dr. Gleitz, Luxemburg,M. Gleitz, U. Dreisilker, R. Rädel. Myofascial pain syndromes are among the most frequent orthopedic disorders. However, efforts to treat these syndromes often show limited success. This is confirmed by the multitude of competing therapy options available today. According to the theory established by Travell and Simons in their Trigger Point Manual (1992), muscular trigger points are one of the main causes of myofascial pain. Clinical observations and experimental examinations conducted by Travell and Simons have corroborated this theory, demonstrating that muscular trigger points cause diverse functional disorders. These findings coincide with the information provided by patients on pain development and progression. Despite the impressively detailed description of muscle- associated pain syndromes in the Trigger Point Manual (1992), trigger point therapy is still only rarely used in orthopedic practice. The role of trigger points in causing pain and discomfort is evidenced by the clinical symptoms they may generate: formation of muscle knots with local and referred pain, muscular taut bands, twitch response, reduced range of motion (ROM) of joints, formation of satellite trigger points, development of pseudoradicular dysesthesia and vegetative accompanying reactions. According to Simons’ “integrated hypothesis of trigger point formation” (1996), trigger points are produced by muscular motor end-plate dysfunction which may be caused by various mechanisms, such as acute mechanical overstrain, including trauma, chronic overstrain caused by monotony of motion (repetitive strain injury), poor posture, cold, emotional distress, or result from articular, neurogenic, visceral, hormonal or remote muscular disorders. The increased calcium release resulting from the above lesions causes a permanent contracture of the actin/myosin filaments (abnormally contracted sarcomeres) under the dysfunctional end-plate and thus leads to increased energy consumption. At the same time, the capillary compression caused by the contraction knots produces local ischemia. The concurrence of these two factors causes a local energy crisis. Local ischemia induces the release of bradykinine in the tissue and of other substances sensitizing muscle nociceptors and increases the tenderness to pressure of the trigger points (allodynia, hyperalgesia). Ischemia causes additional motor end-plate dysfunction and thus creates a vicious circle. Muscles affected by trigger points exhibit changed properties. Apart from the typical contractures, these muscles are characterized by a reduced development of muscular force, delayed relaxation after activity, tendency to spasm and decreased fine motor skills (coordination). These conditions explain the muscles’ susceptibility to additional lesions (muscle strain, torn fibers, etc.). Trigger points cause alterations in the nervous system that contribute to the chronification of pain. These alterations include peripheral sensitization of muscle nociceptors, increased number of nociceptors, activation of the axon reflex, central sensitization (synaptic transmission) and failure of inhibiting interneurons of the supraspinal descending antinociceptive system (8). If trigger points continue to exist over a prolonged period of time, they may activate satellite trigger points in other muscles. These satellite trigger points will develop their own pain patterns and functional disorders. This will eventually induce myopathic chain reactions (2) with complex pain patterns and secondary structural alterations in the form of insertional tendinopathies (3). The typical referred pain caused by trigger points is explained on the basis of the “convergence projection theory” (13). This theory postulates that the information from diverse peripheral receptors in various tissue regions is centrally transmitted through a common segmental dorsal horn neuron, which causes a misperception of pain in the patient. If doctors use an approach that is entirely based on classical neurological innervation patterns, this phenomenon makes it extremely difficult to localize the pain origin. The trigger point therapy of Travell and Simons is the starting point for the diagnosis and treatment of myofascial pain syndromes. As trigger points are difficult to localize and trigger point therapy has only limited efficiency, this therapy option is rarely used in practice. Shock wave application to trigger points represents a new therapy approach in trigger point treatment. The combined use of radial and focused shock waves allows effective local trigger point treatment as well as shock wave application to a wider muscle surface area. Focused shock waves can be used to induce referred pain for precise trigger point localization. The experience gathered by the authors has shown that a wide range of functional disorders can be treated with trigger point shock wave therapy. The therapy success is based on recognizing muscular trigger points as the origin of pain, which sets this therapy apart from conventional treatment methods. No scientific evidence is available to date explaining the precise mode of action of shock waves applied to muscular trigger points. Since the mid-1990s, various publications have discussed the possibility of muscle treatment with low-energy focused shock waves (4, 5, 7, 14) as an alternative to manual therapy. The common result of the treatments conducted is a reduction of muscle tone along with a diminished extent of muscle shortening. Since the late 1990s, muscular trigger points have also been treated with radial shock waves (rESWT) with a tissue penetration depth of 20 to 25 mm. While no scientific evidence is available to date explaining the exact mechanism of radial shock waves, extensive molecular and biochemical research has been conducted into the mode of action of focused shock waves (6, 18). In fact, focused shock waves induce a reduction of nociceptive fibers, whereas radial shock waves seem to have a counter-irritation and pain modulating effect through GABAergic interneurons in the dorsal horn. In addition to this action, the pressure and vibrations of radial shock waves improve blood circulation and lymphatic drainage. Indications and contraindications: Trigger point shock wave therapy can be used to treat all acute and chronic myofascial disorders, provided that no primary disease is present that causes the muscular trigger points and prevents their elimination. In the latter case, trigger points and entire trigger point chains must be seen as part of complex disease patterns such as visceral and psychic diseases, craniomandibular dysfunctions or foot deformations with proprioceptive control disorders. Such conditions should be treated by conducting a causal therapy of the primary disease on the one hand and by eliminating the trigger point syndromes on the other hand. Trigger point therapy is most successful if the primary disease causing the trigger point symptoms can be entirely cured or if its intensity can at least be minimized. Despite causal therapy, trigger points are frequently found to persist or to develop independently. This condition, which is referred to as autonomous trigger point syndrome, can be well treated with trigger point shock wave therapy. One example for this phenomenon is pseudosciatica after successful discectomy. The trigger points in the gluteal muscles, external rotators (e.g. piriformis muscle) and quadratus lumborum muscle that were activated by the original nerve compression continue to persist despite the fact that the root compression has been eliminated. Successful resolution of these trigger points is only possible by means of trigger point therapy. Examples of poor indications for trigger point therapy are genuine radicular lesions or advanced spinal or foraminal stenosis in the lower lumbar segments, also with secondary trigger points in the gluteal or hip muscles. Although trigger point therapy of these conditions frequently provides alleviation of pain, this effect will only be of short duration owing to the dominant nature of the nerve compression. Trigger point therapy is not successful in the treatment of the following disorders: all types of rheumatism with inflammatory activity, severe fibromyalgia and severe vegetative dystonia. General contraindications for trigger point therapy include malignant tumors, primary myopathies, serious rheumatic diseases (e.g. rheumatic polymyalgia) or treatment areas above vulnerable structures. During shock wave therapy, it is crucial that pulmonary tissue is not within the target area of focused shock waves. Relative contraindications include pregnancy and anticoagulant therapy. Radial or focused shock waves? The combined use of focused and radial shock waves is one of the recent developments in trigger point therapy. With this approach, focused shock waves are used to treat both tendon insertions and muscles. The application of focused shock waves to tendon insertions is recommended whenever muscle shortening caused by trigger points has resulted in secondary insertional tendinopathies. In these cases, treatment of the muscular trigger points alone would not be sufficient to cure the disease as the tendon irritation is often responsible for the dominant pain symptoms and would persist as an independent cause of pain even after successful muscular trigger point therapy. Focused shock waves applied to muscles are used for diagnostic and therapeutic purposes. On the one hand, they ensure precise localization of the trigger points as the typical referred pain can be induced more reliably than during manual examination. On the other hand, focused shock waves are used for the local treatment of individual trigger points. Thanks to the minimal irritation they cause, focused shock waves can also be used for the trigger point therapy of extremely painful muscles. Radial shock waves are used for the local treatment of muscular trigger point areas and, subsequently, for smoothing the residual muscle. This method allows large muscle regions to be treated with radial shock waves. When treating extremely painful myofascial syndromes, only focused shock waves should be used during the initial therapy sessions. Treatment can then be continued with radial shock waves at low therapy pressure (1.6 – 1.8 bar). Promising experience has been gathered recently in the use of defocused shock waves for the treatment of trigger points or insertional tendinopathies. “Defocused” means that the generated waves are applied to the tissue not in a single spot but over a wider surface area. Therapy planning: The muscles to be treated are selected on the basis of the following criteria: patient’s indication of pain, diagnosis of muscle knots (manually or with radial shock waves), possible provocation of referred pain by palpation pressure or with focused shock waves and, where possible, ROM testing to identify the muscles affected by reductions in the range of motion. The anamnesis and description of the pain with respect to the pain location and referral are of special importance. Detailed knowledge of muscle-specific pain patterns, which deviate entirely from classical neurological innervation patterns, allows early identification of the muscles involved in the pain syndromes. Descriptions of pain provided by patients, which do not make sense under neurological aspects, prove astonishingly coherent and informative when considered under trigger point aspects, all the more so because trigger points can also be responsible for dysesthesia, coordination disorders and loss of strength. Knowledge of the muscle-specific pain referral described by Travell and Simons (1992) represents an indispensable requirement for every therapist. Increasing experience in trigger point therapy, especially in the use of focused shock waves, has shown that pain referral patterns and the location of muscle knots vary in each patient and need to be identified by accurate examination. Localization of trigger points: The induced referred pain is a major criterion for the selection of the therapy region. Strong manual pressure is exerted on the muscle knots to cause referred pain. Focused shock waves can be applied to induce referred pain more easily and accurately. Depending on the muscle thickness and depth of the trigger point areas, focused shock waves with variable penetration depth are applied at an energy level of between 0.05 and 0.25 mJ/mm2. Radial shock waves are less suitable for the localization of trigger points on the basis of referred pain. Radial shock waves are rather used to identify indurations inside the muscles. This is done by moving the applicator over a large muscle area during the therapy. Therapy procedure: The trigger points to be treated are selected according to the criteria of short-term or long- term reduction of the pain symptoms. Therapy is started by treating the active trigger points which are responsible for spontaneous current pain or pain on exertion. This is followed by the treatment of satellite trigger points in the area of pain referral. Similarly to secondary trigger points in the functional muscle chains of antagonists and synergists, satellite trigger points are responsible for the chronification process if they persist for a prolonged period of time. Insertional tendonitis, which Travell and Simons (1992) describe as peripheral trigger points, should be given special attention. These trigger points must be treated with focused shock waves. However, contrary to the treatment of muscular trigger points, a reduction in pain is only perceived several weeks after the therapy. This is due to the slowness of the induced physiological repair mechanisms. In this context, the energy flux density is of major importance. Experience has shown that shock waves should be applied at a low energy level in order not to affect the cell recovery potential, that is the useful neurogenic immediate tissue response. Since treatment is performed on a biological system, the therapy intervals between the individual sessions should not be too short (at least 1 to 2 weeks) and the number of therapy sessions should be limited. It is also crucial that no local anesthetic be used prior to shock wave application (12). Accompanying therapies: In principle, no accompanying therapies are required to achieve the desired therapy success. However, shock wave therapy can be supported by trigger point stretching in fiber direction. In the presence of severe joint blockage, the blockage may loosen as a result of muscle relaxation after shock wave therapy. If this is not the case, manual therapy can be performed to eliminate the blockage after the first two or three trigger point therapy sessions and after muscle tension has started to decrease. Additional therapies, such as massaging, should not be used. Muscle strengthening therapy can be performed one to two days after the trigger point therapy. However, it is crucial that this therapy not be performed with maximum force or at the point of maximum muscle shortening. In the treatment of chronic pain syndromes, ibuprofen or paracetamol should be administered at the beginning of the trigger point therapy to relieve the pain. Treatment parameters and duration: The energy flux density of focused shock waves used in muscular trigger point therapy is between 0.05 and 0.25 mJ/mm2. Higher energy levels should not be used to avoid tissue damage (11). Judging by the latest scientific research results, the shock wave frequency applied to the trigger point should not exceed 4 Hz. The energy flux density (mJ/mm2) is selected on the basis of the thickness and depth of the muscle and the patient’s indication of pain during localization of the trigger points and provocation of referred pain. The energy flux density should be selected in such a way that the pain induced by the shock waves can still be well tolerated by the patient. Generally speaking, the energy level can be increased after each therapy session as the pain perceived during shock wave application gradually decreases if the therapy progresses smoothly. The same applies to radial shock waves. The therapy pressure of radial shock waves varies between 1.6 and 4 bar, depending on the shock transmitter size and the patient’s indication of pain. Shock transmitters with a small surface should be used with extreme caution owing to the high peak pressures they may generate. Judging by our experience, such shock transmitters are generally not required for the muscles to be treated. The pressure applied should be adequate for the tissue properties to avoid hematomas. The shock wave frequency is 10 to 15 Hz, where the 15 Hz frequency is generally perceived as causing less pain. This effect may be attributable to the physiological intrinsic muscle oscillation stimulated by the radial shock waves. In the combined use of focused and radial shock waves in trigger point therapy, the trigger points are first treated locally, applying 200 to 400 focused shock waves. This step is followed by muscle smoothing of the agonists, antagonists and synergists with the radial shock wave transmitter, applying 3000 to 4000 radial shock waves. If muscles are treated with radial shock waves alone, the trigger point area is treated locally with 500 to 1000 shock waves and without applying manual pressure. This step is then followed by muscle smoothing with up to 4000 shock waves at a frequency of 15 Hz, in accordance with the stretch-and-spray technique developed by Travell and Simons (1992). Treatment frequency: A therapy frequency of one session per week has shown to be ideal for most patients. These intervals enable the muscles to recover from the irritation, which may initially persist for up to three days. Shorter intervals might cause additional muscle irritation before the irritation from the previous session has actually disappeared and thus increase pain. Insertional tendonitis should not be treated at shorter intervals in order not to affect the aforementioned regeneration potential that results from the local neurogenic tissue response. Pain modulation aspects, too, suggest that the treatment intervals in trigger point shock wave therapy, similarly to acupuncture, should not be too short. The following general principle applies: longer therapy intervals and lower treatment intensities should be used for more serious and chronic pain syndromes. Therapy progress: pain relief, side effects and complications. In the treatment of most trigger point syndromes, a reduction in pain is generally perceived after 4 to 6 therapy sessions, or even after as little as 1 to 2 sessions in the case of short- term conditions. Chronic syndromes with many different affected muscles require 6 to 10 or even more therapy sessions to eliminate the pain. If the therapy proves unsuccessful after this many sessions, treatment should be interrupted and the indication should be checked. A short-term increase in the original pain and, in very rare cases, the manifestation of other muscular disorders may occur after the initial sessions. Shock wave application to the cervical spine may cause headache and temporary buzzing in the ears, especially when radial shock waves are used. Patients who are suffering from migraine or are susceptible to tinnitus must be informed about these possible side effects. In these cases, the shock waves should be applied at a low pressure (1.6 bar), and patients should wear ear protection. The same applies to the application of focused shock waves. No serious complications will occur if the shock waves are applied correctly in terms of the shock wave energy levels and penetration depth. The most frequent side effects include local hematomas, especially in the gluteal muscles, caused by radial shock waves. Should a temporary interruption of the therapy prove necessary due to the aggravation of pain or the extent of the hematoma, the therapy intensity (energy flux density, treatment pressure and total number of shock waves applied) should be reduced when treatment is continued. The intensity can then be increased again during the following therapy sessions. Therapy success: Trigger point shock wave treatment is considered successful if over 80 % of the original pain has been eliminated at the end of the therapy. The residual 20 % may well disappear during the three months following the therapy, which means that it does not make sense to permanently continue treatment. A successful therapy should provide lasting pain relief or at least eliminate the pain for 6 to 12 months. If the original pain is reduced by as little as 50 %, additional trigger points are likely to exist in the functional muscle chain. These trigger points, which may be latent in nature, should be identified.If pain reduction rates of only 20 to 30 % are achieved at the end of the therapy or if the pain relief lasts only a few weeks, additional differential diagnostics of the disorder will be necessary. The recommendations below are based on several years of experience acquired by the authors in the field of orthopedic trigger point shock wave therapy. Cervicalgia, cervical cephalalgia, cervicobrachialgia: These indications respond particularly well to trigger point shock wave therapy as the affected muscles (except for the trapezius muscle) are rather small and located close to the body surface. The local pain, which climbs up into the head, is primarily caused by the descending and horizontal parts of the trapezius muscle and by the semispinalis muscle, splenius muscle, levator scapulae muscle and sternocleidomastoideus muscle. Apart from the scaleni muscles, the muscles that are responsible for pseudoradicular brachialgia are all located in the shoulder girdle region (subscapularis muscle, infraspinatus muscle, teres muscles, serratus posterior superior muscle, pectoralis muscle). A reduction in pain is achieved after 6 to 8 therapy sessions, along with a lasting increase in mobility of about 20 degrees rotation, 17 degrees inclination/reclination and 17 degrees lateral inclination. If no improvement is achieved, examinations should be conducted to find out whether the patient suffers from temporomandibular dysfunctions or psychovegetative exhaustion. Lumbalgia, pseudoradicular lumbosciatica: These indications can also be treated successfully, provided that the patient does not suffer from dominant radicular irritations (prolaps, foraminal stenosis with segmental deficiencies), arthrogenic irritations (activated facet syndrome, spondylolysis) or discogenic irritations (erosive discopathy). Local pain in the lumbar spine is caused by trigger points in the segmental muscles (multifidi and rotator muscles), in the dorsolumbar junction (iliocostalis lumborum and thoracis muscle) and in the iliopsoas muscle. Referred pseudoradicular pain is caused by trigger points in the gluteal muscles (gluteus minimus and medius muscles), in the external hip rotators and in the quadratus lumborum muscle. In these cases, referred pain (in the lower leg and foot) can be easily induced by applying focused shock waves. Dorsalgia: The primarily local pain is caused by trigger points in the multifidi and rotator muscles and, in the interscapular region, by trigger points in the rhomboidei muscles, serratus posterior superior muscle and in the ascending part of the trapezius muscle. Periarticular shoulder pain and restricted mobility: The term “periarthritis”, often reluctantly used, plays a major role in the description of these conditions as many types of shoulder pain originate in the periarticular muscles and cause restricted mobility (infraspinatus muscle with reduced internal rotation and anterior shoulder pain, subscapularis muscle with reduced external rotation and posterior shoulder pain). Referred pain in the lateral upper arm is caused by trigger points in the horizontal part of the trapezius muscle, in the supraspinatus muscle and in the deltoid muscle. Insertional inflammations of the supraspinatus tendon have to be treated separately with focused shock waves. Frozen shoulder, a condition characterized by painful shoulder stiffness and pain caused by capsular contracture, cannot be treated successfully with trigger point shock wave therapy. Radial and ulnar epicondylopathy: In general, these indications are no promising candidates for trigger point therapy. Most disorders are caused by local insertional tendinopathy, and not by referred pain. However, early stages of these conditions, which are caused by muscular overstrain of the forearm flexor and extensor muscles, can be treated successfully. In the case of chronic pain syndromes, treatment of the muscle chains is a viable attempt. Radial epicondylopathy: scaleni muscles, horizontal part of trapezius muscle, supraspinatus muscle, lateral part of triceps brachii muscle, anconeus muscle, supinator muscle, brachioradialis muscle including forearm extensor muscles. Ulnar epicondylopathy: serratus posterior superior muscle, infraspinatus muscle, pectoralis muscle, medial part of triceps brachii muscle, pronator teres muscle and forearm flexor muscles. Local insertional tendinopathies have to be treated with focused shock waves. Wrist tendonitis: Wrist tendonitis is caused by overstrain of the forearm muscles involved in wrist movement. Accompanying trigger point shock wave therapy must be performed by applying shock waves to the affected forearm muscles. Pelvic/hip pain: Pelvic/hip pain can be successfully treated with trigger point shock wave therapy. The frequently diagnosed trochanteric bursitis is often caused by trigger points in the gluteal muscles and the external hip rotators. Local trochanteric pain has to be treated with focused shock waves. These trigger points may have been caused by previous lumbar spine pain syndromes or by a developing coxarthrosis and residual conditions after total endoprosthetic surgery. Sciatic pain, which is caused by trigger points in the gluteus maximus muscle and in the ischiocrural muscles, responds well to trigger point shock wave therapy. Tensor fasciae late syndrome: Overstrain of the tensor fasciae latae muscle is very common among runners and causes lateral hip and thigh pain. This condition is often accompanied by trigger points in the gluteal muscles and vastus lateralis muscle. Adductor tendinopathies: Although adductor muscles can be easily reached with shock waves, they are still difficult to treat. This is due to the fact that, in addition to trigger points, there are insertional tendinopathies in the proximal and medial third of the muscles on the pelvic insertion. Shortening of thigh flexor and extensor muscles: The most frequent symptom of this condition is recurrent muscle sprain caused by increased muscle tension. It can be treated successfully with shock wave therapy, but requires a high number of shock waves due to the large size of the muscles involved. Patellar chondropathy: This condition is often characterized by a shortened quadriceps and by trigger points in the medial and lateral vastus muscles near the knee joint. Quadriceps shortening can be reliably objectivated by measuring the heel-to-buttock distance in prone position. Successful results are achieved after only two to four therapy sessions. Moreover, parapatellar pain often manifests itself after total endoprosthetic surgery and can be well treated with trigger point shock wave therapy. Patellar tendonitis: In addition to the symptomatic tendonitis, which can be treated locally with focused shock waves, this condition is often characterized by a shortened quadriceps muscle. Although trigger point shock wave therapy provides excellent quadriceps relaxation, the tendonitis often takes several months to cure completely. Shin splint: Tendons and the periosteum are the dominant pathological features of shin splints and must be treated with focused shock waves. 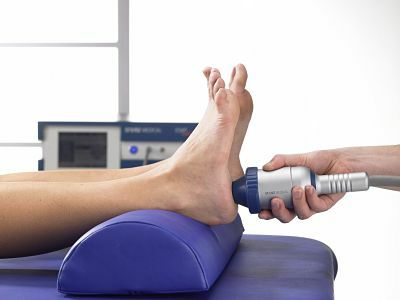 Accompanying radial shock wave therapy can be performed to eliminate indurations in the medial calf muscles and in the flexor hallucis longus muscle. Anterior tibial syndrome: Trigger point irritation of the anterior tibial muscle is encountered among runners and after mountain descents due to muscular overstrain. Shock waves are exclusively applied to the muscles. Achillodynia: The dominant pain symptoms in achillodynia are caused by tendonitis, which is treated locally with focused shock waves. Achillodynia is frequently accompanied by calf muscle shortening. 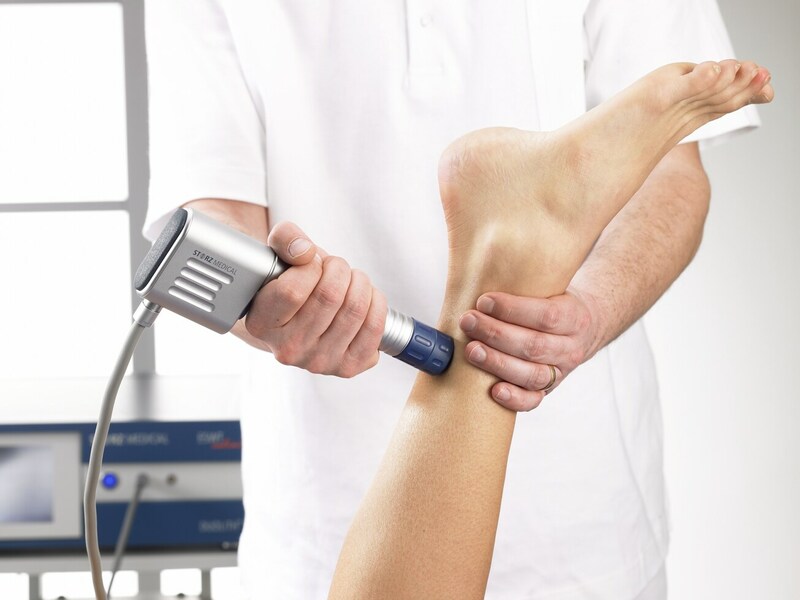 Shock wave therapy should be extended to treat these contractures as a reduction in the calf muscle tension by trigger point therapy will also relieve the Achilles tendon (similarly to raising the heel) and is reported by patients to provide rapid alleviation of pain. The experience gathered by the authors has shown that trigger point therapy ensures a lasting improvement in the frequently restricted active ankle joint extension from 16 degrees to 25 degrees after 4 to 5 sessions. Plantar fasciitis of the heel (plantar calcaneal spur): In most cases, sonographic diagnosis reveals that the frequent X-ray diagnosed calcaneal spur is a severe plantar fasciitis below the calcaneus, characterized by fascial swelling of 4.5 to over 12 mm (normal value < 4.0 mm). This means that on the one hand local therapy is required, applying focused shock waves to below the calcaneus. On the other hand, the therapy should also focus on eliminating muscle contractures of the calf muscles and plantar muscles, which form a functional chain. Metatarsalgia: Pain in the forefoot is frequently caused by splay foot related overstrain of the longitudinal and transverse muscles. This pain can be reliably eliminated with radial shock waves in 4 to 5 sessions, provided that it is not accompanied by periosteal irritations of the metatarsals and that Morton’s neuromas are excluded. Discussion: The many different types of disorders described above have shown that the combination therapy with focused and radial shock waves can be successfully used for a variety of indications in the treatment of myofascial pain syndromes. It has been pointed out that an accurate anamnesis, especially with respect to the patient’s indication of pain, is of special importance. Extensive differential diagnostics is, of course, required, which means that extracorporeal shock wave therapy is and will continue to be a medical procedure to be performed by doctors. Even if radial shock wave therapy is delegated to a physiotherapist, the diagnosis must still be made by the physician. If no lasting improvement in the condition is achieved or in case of a poor therapy success, the physician will be required to re-examine the patient. Palpation or pinch test diagnosis with provocation of the typical referred pain and local twitch response of the muscle, which is sometimes impossible to induce, continue to play a major role in clinical screening. Functional and stretching tests are performed to complement clinical examinations. The use of focused shock waves for the localization of muscular trigger points has proved its worth as a new diagnostic procedure. This method is more accurate than localization by dry needling. The characteristic referred pain can be reliably induced. Pain localization with focused shock waves is performed at a low frequency (3 Hz) to ensure successful feedback from the patient. Treatment is started after having successfully localized primary, satellite or secondary trigger points. The precise mode of action of shock waves applied to muscular trigger points has not been defined to date. However, the shock wave mechanism can be explained on the basis of known theories (1). The pain relief provided by shock waves is due to counter-irritation and pain modulation comparable to dry needling. Owing to the specific physical properties of shock waves, this therapy can be described as needle-free acupuncture which induces a down-regulation of nociceptive afferents through enkephalinergic interneurons in the dorsal horn of the spinal cord. The pain modulation achieved with radial shock waves through the activation of A-beta fibers in the muscle, which then provide pain inhibition through GABAergic interneurons in the dorsal horn, can be explained in a similar manner. This would confirm the findings of Travell and Rinzler (1952), who observed many years ago that pain is relieved and trigger points are eliminated after pressure and stretching. The vibration (15 Hz) of radial shock waves also seems to have a favorable effect on muscular structures. The physiological intrinsic oscillations of 15 to 30 Hz have been described by Nazarov (1988) as important for muscular blood circulation and lymphatic drainage. On the basis of Simons’ integrated hypothesis of trigger point formation (1996), according to which muscular end-plate dysfunction and an energy crisis caused by local ischemia are the central features of trigger point pathologies, the following additional shock wave mechanisms are discussed: mechanical resolution of permanent actin/myosin contractures through local transverse stretching of the sarcomeres by the application of shock waves perpendicular to the fiber orientation up to the destruction of abnormally contracted sarcomeres through the energy applied, reactive local tissue hyperperfusion and angioneogenesis (18), which would eliminate the ischemia responsible for the energy crisis, and eventually thinning of vasoneuroactive substances by the pressure exerted on the tissue by shock waves. All these mechanisms could explain the clinically observed reduction in muscle tension and muscular contracture. Judging by the results of recently conducted animal tests, the effects of focused shock waves in the treatment of insertional tendinopathies, referred to as “attached trigger points” by Travell, are molecular, biochemical and cellular in nature (6, 10). Neurogenic messenger substances such as substance P or CGRP are considered to induce plasma extravasation, angiogenesis and neurogenic inflammation. Similarly to the chemical stimulus produced by capsaicin, shock waves used to induce a mechanical stimulus can cause immediate local tissue response, which would explain the regeneration of tendon tissue. While the results of the aforementioned animal tests and pain therapy considerations may explain the effects of extracorporeal shock wave therapy in the treatment of trigger point syndromes associated with insertional tendinopathies, no clinical confirmatory studies have been conducted to date to verify the experience gathered in practical application. Further research is therefore required by university scientists and by the shock wave study group of the DGOOC (German Society for Orthopedics and Orthopedic Surgery).